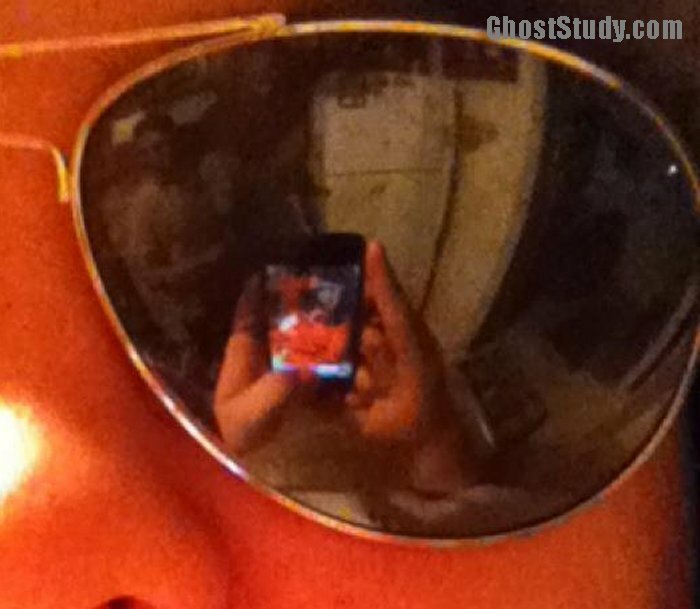 → FREAKY SIDE SHOW - Ghost Photos-Not for analysis. 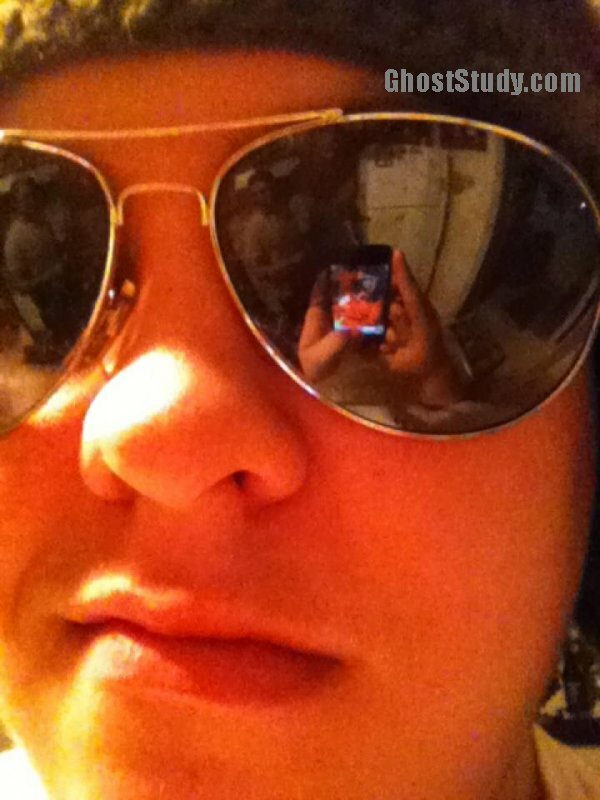 Reflection In Sunglasses - Ghosts? ...devils? Who knows for sure what's going on here. But it's fascinating to consider the possibilities. More and more people are writing me now with strange figures showing up "as reflected". It seems to be the latest ghost hunting technique. Joey's friend is the prominent figure in the picture. The others are unknown. Joey writes, "In between my refrigerator and friend Chris, you can see a huge entity-like figure blocking my cabinets, counter, and stove. It's slightly hunched over. It's face and features are clear. On my friends other shoulder you can see the image of a old woman who looks just like my late grandmother. I've caught very disturbing video and audio evidence before, but they were so frightening that I deleted them. If this makes the website I'll try to catch more and submit it. My name is Joey T***** City: Ransom in the state of Kentucky." Jim's comments... I'm posting this in "Gallery #2 (not for critical analysis)... but you are welcome to express your thoughts. Interests:Anything artistic, baking, cooking, waffles, comics, games, hamsters, and um, things lol. This image makes me nervous. That little "Alien" guy around the corner makes me panicky. But I am very interested on what all goes on around that house, To me, the entity on the counter has a skull-like face. Very spooky. WELL! This one's definitely a trip to Creepytown! 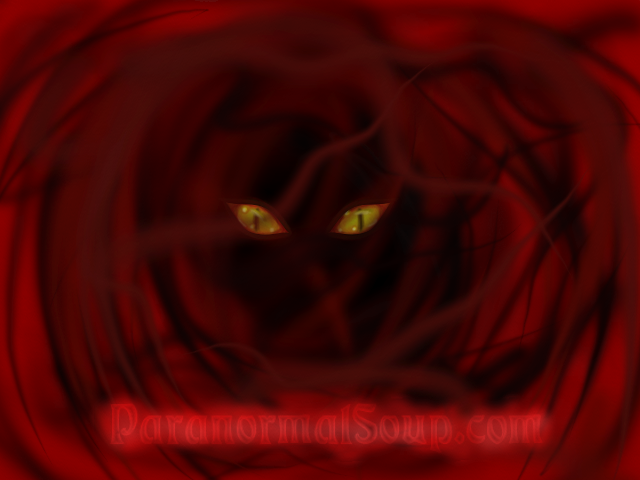 ....There may also be something between Mr. Beardy and The Spooky Twins, as well. To borrow a phrase from a fellow forum member here from a long-while back, this gives me the "whoopie-jingles". This must be a rather interesting house, to say the least! ....It's the white shirted person walking with "Skeletor" but it looks like a regular older person in glasses, a light-colored polo shirt and dark pants. They appear to be looking at us rather than to the side despite being the same moment and the same shot. Finally; Is this outdoors, like looking into a garage or shed? The sunglass wearer has a lot of sunlight on their face. Edited by SpukiKitty, 10 March 2017 - 10:39 AM. The guy in the white shirt is the photographer's friend lol, so he is actually there. AH! I didn't know that! Well; I guess the anomalies are Skeletor, Grumpy Beard Guy and the Spooky Twins. ....but it's still weird. Glasses distortion can only explain so much. They look NOTHING alike! They look like two different heads looking in two different directions (despite being the exact same person/reflection taken at the same moment). EDIT: Wait! Really studying it I realize that the face is actually the same but the classes and slight lighting differences give the illusion of the person getting a different head. Edited by SpukiKitty, 11 March 2017 - 10:24 AM. ....and I interpreted the friend's face wrong in the first photo. And the old lady peaking over the friends shoulder. Is grumpy beard guy the one peaking around the corner? Because to me, he looks like and Extra Terrestrial. Yeah; Beard Guy is the Alien. We're seeing different things with different screens. I can see where it looks like an alien. That's a lot of work, SpukiKitty! ....... thank you for that! Some of these images are now coming to life. wow theres a lot going on in this image, the big beauty one looks like a hogs head or something like that, looks and feels a little demonic! the alien guy is a little freaky too. interesting pic! Could you point out the hog's head? Is it on Skeletor? The Bearded Guy/Alien? The Spooky Twins? The Friend's Face. What's a "Big Beauty"? Back to FREAKY SIDE SHOW - Ghost Photos-Not for analysis.